I was going to save this for next week but I got a chance to take pictures and I love it so much so I figured why not end the week on a high note with a Finished Object Friday! I told you I got my knitting mojo back and over the long weekend last week I knit up a new cardigan. 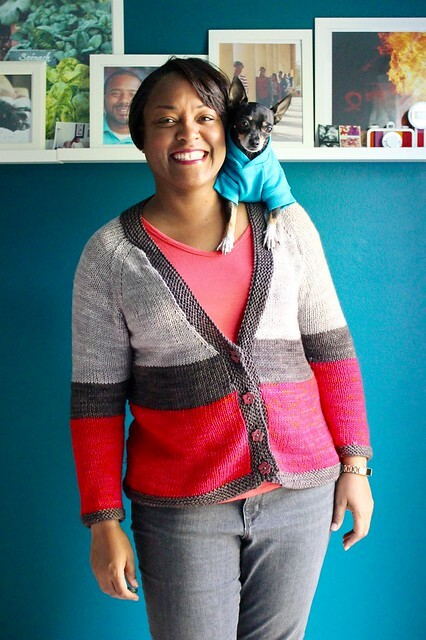 Meet my Colorblocked Boyfriend cardigan. Let me take a step back and talk about how this cardigan came to be because it was not in my queue and was not on my list of must make things for fall. But then I saw this Madelinetosh DK yarn in Torchere (and can’t find it online anywhere) at Looped Yarn Works and it was so striking and gorgeous I had to have it. There is no photo that does it justice but it is an insanely vivid pink with bits of orange and red and it’s just insanely gorgeous in person. I. LOVE. THIS. YARN. I picked up two skeins even though I wanted to buy all the skeins but I knew better than to blow my grocery budget on yarn. When I thought about what it would become I realized I also had two other skeins of neutral yarn I randomly picked up because they caught my eye and I thought they could go with another project. So I added in the Neighborhood Fiber Co studio worsted in Druid Hill (the dark grey brown) and Miss Babs Yowza in Oyster and I knew I could make a sweater. 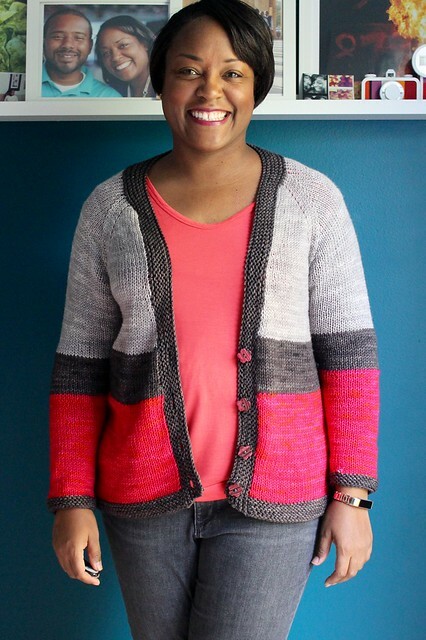 I used the free pattern, Shapely Boyfriend cardigan but made a few modifications: I added in a garter stitch panel on the sides, changed the increases from what was on the pattern and went with a garter stitch border instead of ribbing. I also used this buttonhole technique and I think this is what all my buttonholes will be from now on. It gives them a nice reinforcement. It’s a great pattern to put your own twist on. Even though all my yarn was dk weight/light worsted and the pattern called for worsted weight I knew I could get the gauge using size 10 needles based on my Cracked Pepper cardigan. 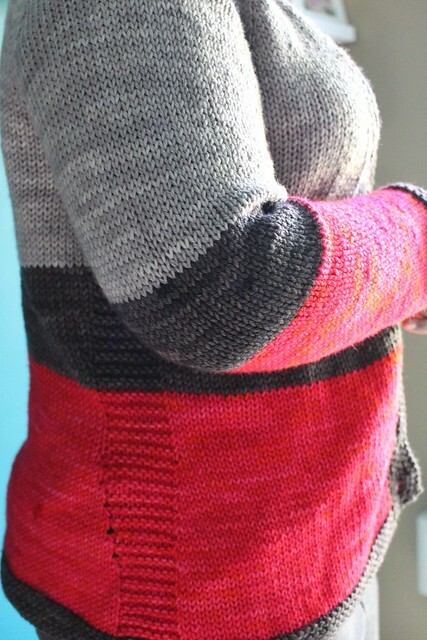 Plus I love the drape of the fabric created on those needles so I set out on Saturday morning to whip up a cardigan. By Monday morning it was blocked and drying and on Tuesday I went back to Looped Yarn Works and picked up the most perfect buttons that have every color of the three yarns I was working with. It just all came together in such a lovely way. I will admit, the pink is so intense that it did bleed a little bit on my white tee the day I wore it (Wednesday because why wait?!) but I washed the tee with some OxyClean and it came right out – no harm! I also feel like I finally got a perfect sleeve, I always seem to struggle with that on all my sweaters. This has some room to put on a long sleeve shirt underneath and it’s a great weight for this time of year all the way into spring. I may wear this piece to death. And what makes this even better is that I still have lots of yarn leftover so you may see the Great Divide Shawl whipped up in this same color palette in the future. My knitting mojo is back, I’m down to the sleeves on another sweater that will be a gift and I can’t wait to share that next week! 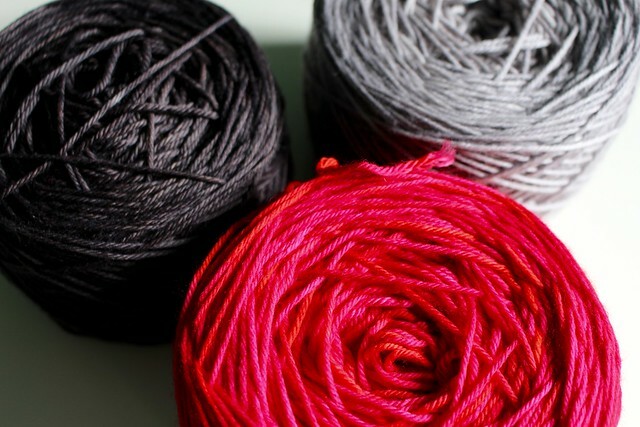 What’s on your needles this weekend? And HAPPY FRIDAY!! Categories: Color, FO: Finished Object, Jellybean, Knitting, Madelinetosh, Miss Babs, My Dogs, Neighborhood Fiber Co., neutral (black/grey/white), pink, Sweaters, YarnTags: #yardsofhappiness, boyfriend cardigan, Color, FO, knit cardigan, Knitting FO, Madelinetosh, Madelinetosh Dk, Miss Babs Yowza, Neighborhood Fiber Co.
Oh my gosh oh my gosh oh my goosh!!!!!!! This is fabulous!! GREAT color combo!! I feel like I can hear you saying oh my gosh. LOL When yarn strikes me I have to make it work somehow and these 3 colors just came together. I hope my coworkers don’t get tired of seeing me wear this one. I purposefully linked to the buttonholes because I knew you’d want to see it. I love seeing how you modify patterns to suit your tastes. The cardigan is nice, and yes, that pink/orange colour is awesome. In my fantasy life, I’ll be finishing some socks this weekend, perhaps going back to one sweater, casting on another, and maybe working on a holiday gift. The socks I’ll definitely finish! Happy weekend. I’m slowly starting to modify more and more. After going through an Amy Herzog class on Craftsy I stopped being so intimidated by modifying. And I’m hoping to get some socks on my needles next too. Have a great weekend! Thank you. Photos do not do justice to that pink of Madelinetosh. She’s a yarn dyeing genius. Soooo classy! This time of year always makes me want to get clicking on the needles, too. Those colors complement each other beautifully… and the little style tweaks pull the style together. Being a small person, I’m always interested in design modifications that aren’t too busy for the size of the garment. This weekend I’m about to start in on a pair of mittens for a friend in your own fair city. She says there’s ice on the windshield some days now? Time to bring out the scraper and the mittens. Yes it’s getting cold in our neck of the woods. The mornings are chilly. I was thinking of whipping up some new fingerless mitts to match my new coat. It’s just fantastic, I absolutely love it. The colours!!! And you look great in it too! Agree with all these comments! Color combo is fab and the sweater looks so great on you!! 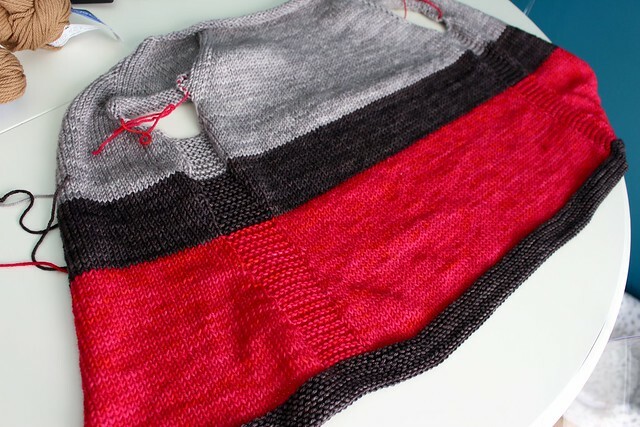 I personally LOVE the garter stitch panels on the side. 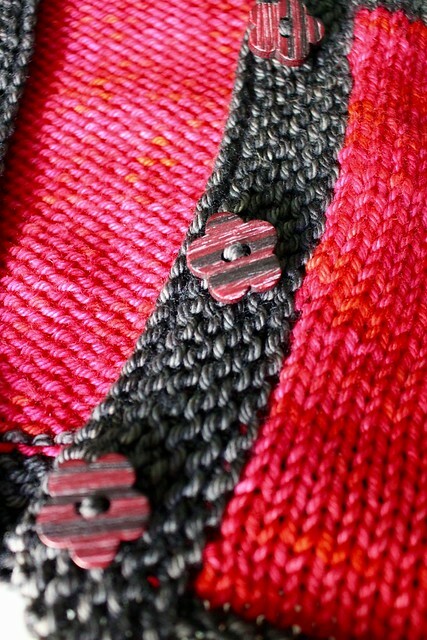 Great finished object—and you do put the rest of the world to shame! #allwaysknitting indeed! You are killin’ it in the garment department Mama. My goal is to have all my sweaters be hand knit sweaters! I’m getting close to that goal. I’m a pretty fast knitter but with a long weekend and a lazy rainy Saturday I can do a lot! Beautiful, the colours go so well together. I just used that button hole technique on a cardigan for my daughter, I agree it seems very reinforcing. Your dog is so cute! Your photos always make me smile!!! They are just pure joy! What a gorgeous cardi!!! Wowsa! You have inspired me. I’m going to start and finish this Thanksgiving weekend! It’s been in my queue on Ravelry for quite a while now. Just started reading your blog last week, tried to go back to start at 2015. I sit and knit and read and am amazed at all that you can knit….and sooooo fast. This Boyfriend Cardigan is my favorite colors. I think I’m going to add that to my queue.